NEWBURGH – Suriana Rodriguez, a recent NFA P-TECH (formerly Excelsior Academy) graduate spoke at the annual 2019 CES (Consumer Technology Association) gathering last week. 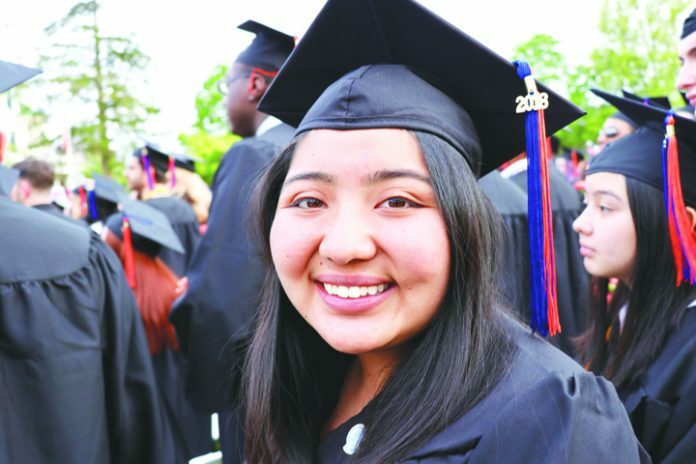 Suriana, is an alumna of NFA P-TECHs inaugural graduating class that celebrated 17 high school graduates who simultaneously earned their associates degree from SUNY Orange last year. Nearly all members of NFA P-TECH also have a mentor and complete at least one internship in the technology field through the program’s partnership with IBM. Suriana was featured at forum in Las Vegas with CEO of IBM Ginni Rometty. After completion of her high school diploma and associates degree in the spring of 2018, Suriana began working for IBM as an Electronics Lab Tech Apprentice. CES® Is the Global Stage for Innovation. CES is the world’s gathering place for all those who thrive on the business of consumer technologies. It has served as the proving ground for innovators and breakthrough technologies for 50 years — the global stage where next-generation innovations are introduced to the marketplace. 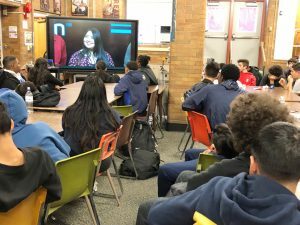 Students observe Suriana Rodriguez, a recent NFA P-TECH (formerly Excelsior Academy) graduate speak at the annual 2019 CES (Consumer Technology Association) gathering last week. Previous articleCongressman Delgado to speak at Women March On!